Don’t call her a party planner. DG Garrity prefers the term event producer. Now she is deep in the final prep stages of producing Inforum, our premier customer conference, slated for Sept. 24-27 in Washington DC. Clearly, putting on and pulling off Inforum is a monster job. We want to know how it’s done behind the scenes—and what makes this Infor woman tick. Many people view your job as exciting and glamorous. Is it? It is exciting; it’s definitely not glamorous. People think I’m a party planner. And people think Lenny Kravitz is going to be my new best friend. He’s not. 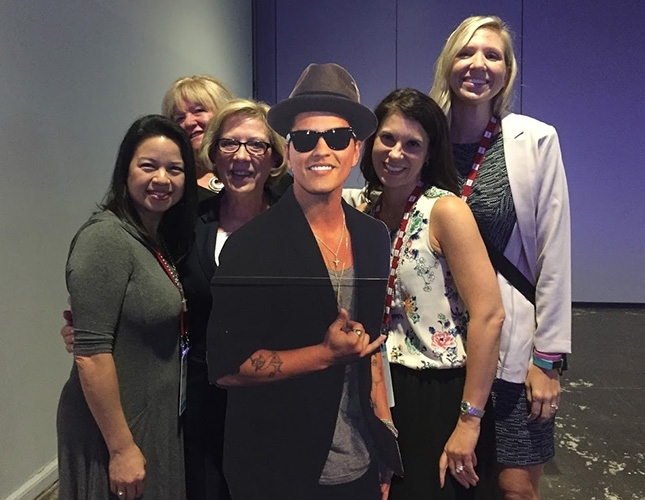 Members of the Infor Events Team pose with a life-size cutout of Bruno Mars, who performed at Inforum 2017 in New York. DG Garrity is second from left. Will I see him? Yes. Will I meet him and shake his hand and say, “Hi, I’m DG?” Absolutely not. If he wants green M&Ms in his dressing room, I’ll be the one to get them, but that’s about it. But the work is exciting to me. I like the challenge of organizing everything, and creating a whole event from infancy to tear down. We always say Inforum is like our baby. It’s our 13- to 14-month gestation period—like a giraffe, and it’s great to see it come alive, and see our customers and partners enjoy it. What are your roles in preparing for Inforum? There’s a timeline: First, we have to set the venue and secure the hotels. Inforum is a big event. There are only 12 cities that can accommodate us logistically. For the hotels, the fewest we have contracted with was 7, and the most, which is this year, is 30. Those are a lot of contracts to get executed. That process took over 3 months this year. Then it’s getting the website up and registration open. After that, we start working on the education session tracks. How many sessions is EAM, HCM, Healthcare or M3 going to get? We base those decisions, in part, on the percentage of customers that are coming. We divide the number of rooms we have based on the attendance goals for each track. Then we start to work with the track leaders on the content for over 900 sessions. We need to make sure we can accommodate all those factors. I call it the Rubik’s Cube. DG Garrity, far right, shares a moment with the Events Team at Inforum 2013 in Orlando. What do you do during the event? The team stays 2 hours ahead of everyone else. We make sure the rooms are ready, the crew is working, the chef is cooking, folks are being registered. We walk around all day, checking every area, and trouble-shoot where necessary. Do you ever sleep during the event? No. Well, the Events Team probably averages about 4 hours a night. Going back to the baby analogy, after it is born, you don’t sleep much for a while. But we know we’ll get a good night’s sleep when it is over. What has been your biggest challenge in managing an Inforum past? The biggest problems have been with the venue. For example, in New York last year, our RFP (request for proposal) included General Session seating for 7,000 to 8,000. Well, in all the planning sessions with the venue, not one person ever said there weren’t enough chairs to set all the session rooms plus the General Session until we were on-site. Suddenly, the team had to urgently find 7,000 more chairs. Little things like that can be a big deal. So that’s a tough part of the job: vendors not clearly communicating and holding back key information until the 11th hour, when it becomes a crisis that must be solved. I call it the unknown. We can do all the planning in the world and, every year, someone is going to hold something back and then throw it at us last minute. So you just juggle it. You do the best you can. What has been your biggest success in managing an Inforum past? Just pulling off a successful event every year is triumph enough—just making everyone happy. Running into a customer in the elevator, and hearing them talk about how great something was. It’s the little above-and-beyond stories, like a customer who was allergic to peanuts, and appreciated that we made sure she had a hot meal. That’s what the Global Events Team likes best. What should people know about Inforum that they don’t know? All the behind-the-scenes efforts to make the event go well for every person involved are enormous. From track leaders to the IT team to the marketing creative team, it takes a village. 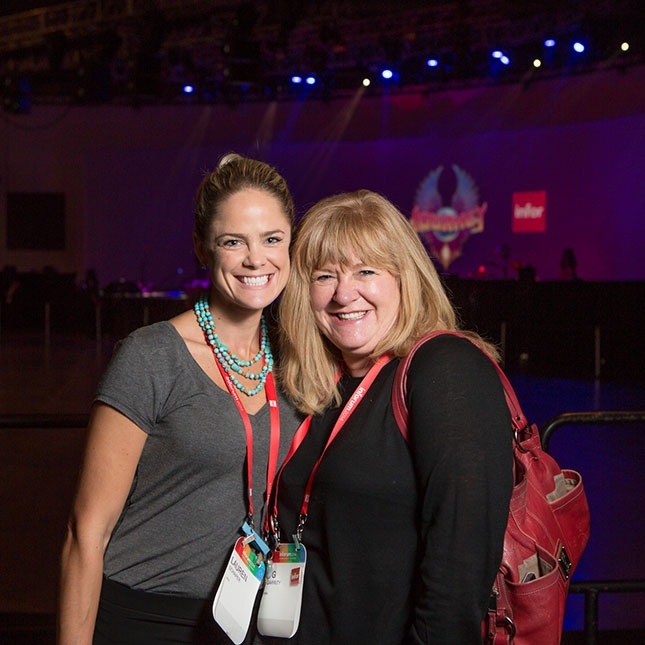 What has been your biggest challenge in managing any Infor event? The things I can’t control, like weather or health. You can’t plan for them. You have to wait until that trigger is pulled. For example, the Global Events Team was in Hawaii last year for a sales team incentive trip when a hurricane hit, and we had to completely change venues on the fly. If you could go back and tell your 5-year-old self something, what would it be? Treat others as you want to be treated. It’s one of my mottos, but at age 5, I didn’t know that. Like I said, it takes a village. You need people to want to help you succeed. It’s hard to call in a favor if you don’t do favors. What do you want people to know about working at Infor as a woman? There is no glass ceiling here. Our management is open to all – male, female, Asian, Hispanic, African-American, it doesn’t matter. It’s about exemplifying the Infor Values. My dad owned an audio visual production company. When I was little, if I wanted to spend time with him, I had to join him on-site in the ballrooms of events he was working. So, that’s how I fell in love with this work—playing with the stage lights vs. on the playground. After graduating from Northwestern University with a degree in hospitality, I worked at a creative agency, McDonald’s Corp., hotels, and production companies. I’ve been on all sides of event production. My hobby is figure-skating. I’ve been skating since I was 3. The Olympics was my aspiration. I had potential, and I trained with Olympic coaches in Colorado. I did not make it, but it taught me so much about discipline, what it takes to get something difficult done. And now I teach skating. I’m on the ice from 6 to 8 am and 6 to 8 pm four days a week. I also used to volunteer on weekends as a judge in skating competitions. I love it. It’s my passion. I have a rescue dog and cat. And the past few years, I’ve really gotten involved with the Big Brothers Big Sisters program. Right now, I am fostering a 5-year-old boy named Cody. I met him as a Big Sister when he was 3. His mother gave him up when he was 6 months old; his father is in jail. Fostering is not a regular part of the program, but Cody had greater needs, so I just fell into it. He lives with his legal guardian during the week, and he comes to me every weekend, unless I’m traveling. When work is crazy, Cody brings me back to reality about what is truly important. When I turned 50, I asked myself: What do I want my life to be about? I decided to invest in my community. We’re a big melting pot in my Uptown neighborhood of Chicago. When I started walking my rescue dog around the neighborhood, I found out more about what was going on, like kids sleeping on floors because they didn’t have beds. So, I take my skills, and I do fundraisers for the school. Gracie, my dog, loves kids, and when we go to the park, the kids all come to pet Gracie. So, I started interacting with the neighborhood kids. On Fridays, if they can show me they got an “A” on a test or have good grades, Gracie hands out ice cream, or we have a pizza party, or—because of my audio-visual skills—we have movies in the park. It’s fun. It’s truly rewarding. 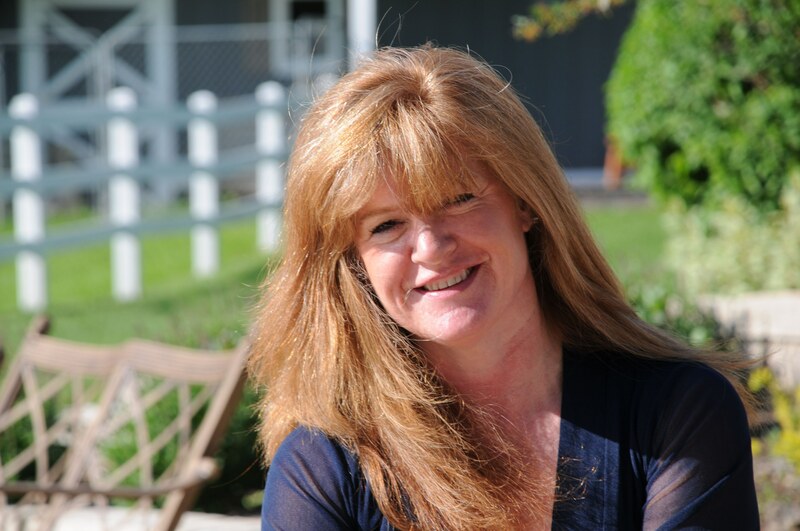 About the author: Marta Cleaveland is editor of The Infor Blog, and a writer with the Infor Corporate Communications Team. She has been a reporter and editor at daily newspapers in Minnesota, Idaho, and South Carolina. She has also worked in the tooling & machining industry, state government, public relations, and environmental nonprofits.